Storybrooke, I missed you! Look at all the familiar faces. Belle and Archie and Grumpy and Blue and Granny and sure I missed Ruby and Whale and Ashley and… this cast is huge. But it was lovely to see Storybrooke and her residents again. We start back at the end of last season with Belle left behind to hide the town. She has to set aside her tears quickly because the Hipsters are coming. They are coming with their blocky glasses and their scarves and their big clunker of a car and they are coming fast. Belle, with the town in tow, rushes to the mine to cast Rumple’s spell by throwing water on a rock and scrunching her brow very tightly. Belle has her first crisis of confidence of the evening but she pushes through it and succeeds in putting up a golden barrier around Asgard. Er, Storybrooke. But I’m pretty certain it’s the same effect. Which means Belle is channeling Idris Elba so she should really be less down on herself. Back in Neverland of the present, Rumplestiltskin and Regina are giving Ariel her mission. Find Belle, give her a magic sand dollar, and bring back the secret super Pan trap. The bracelet will give her legs for 24 hours and when she comes back they’ll tell her where to find Eric. Ariel asks how she’s to know the Queen will keep her word and Regina says, I guess you’ll just have to trust me. But I don’t really see the downside for Ariel here. Apparently Pan and Neverland have no hold over her so she can’t get in trouble for leaving or helping and she gets to go on an adventure and possibly-hopefully get exactly what she wants. Away she goes. Pan’s spidey senses tell him someone left Neverland and he decides to up his game. Henry: You’re hiding something from me. I bet it’s my family. Pan: I’m your friend! Trust me. Felix: I’m gonna go do that thing that we’re not telling Henry about. Henry: I’m gonna follow him into this obvious trap because I’m 11 and also this place is boring. Back at Camp Angst, Emma is trying to get things done while everyone else mopes. This is a summary for the entire episode. Per Neal the only way off the island is to kidnap Pan’s shadow and use it as a Peter Pan Jet (which makes way more sense than a Peter Pan Bus, lbr). Emma: Fine, whatever, where is it? Meanwhile Snowing are in a fight. They decide to split up as Love Triangle and Troubled Couple for plot development. LT head to Dark Hollow to capture the Shadow and TC are off to Pixie Hollow to get Tinker Bell up to speed. 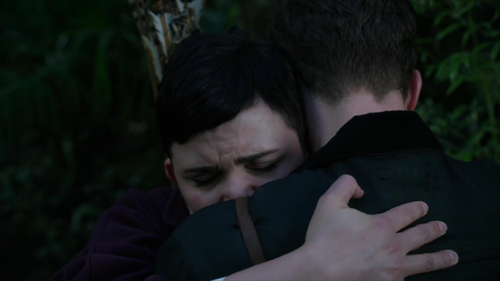 Snow takes a moment to warn Emma she’s in a Love Triangle and Emma asks Snow to go easy on Dad. To which Snow answers that she clearly inherited his tunnel vision and I rejoiced that Snow actually does understand her husband’s huge flaw. And it’s okay Emma doesn’t because Snow is right, she is very much like him in that. In Storybrooke of the present, the Dwarves are having a picnic by the sea. It’s been a week since the Jolly Roger carried the A Team to Neverland and the B Team are enjoying the lack of chaos. Ignorance is Happy. But Grumpy has always been closest to Snowing and chimes in to knock down Happy in the name of Hope. And as if the plot heard them Ariel appears to drag the B Team back into the fight. Up on the docks the Hipsters, who got into Asgard after all, also hear them. Here comes chaos! Belle is moping in Granny’s because Ruby is too busy to be on the show. 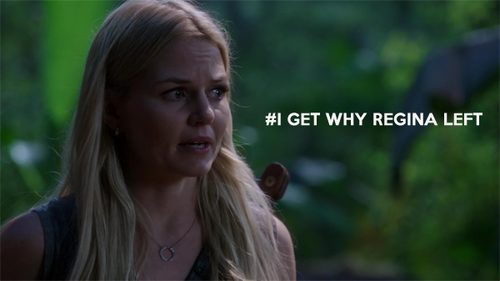 Though she says it’s because Rumplestiltskin took off without her and told her he’s not coming back alive. Archie: Why so glum? You saved the town. Belle: I threw water on a rock. If I was really a hero I’d be on the A Team not babysitting Brigadoon. Rumple didn’t take me because he doesn’t need me and if Rumple doesn’t need me I’m useless. 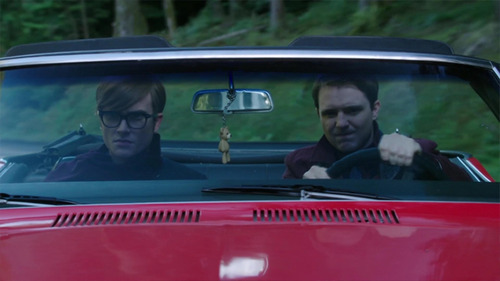 Archie: We need to work on your self esteem. How’s Thursday? Grumpy: What if I told you Rumple DOES need you? Look! He sent a mermaid! Ariel: Hi! Have a magic sand dollar! Belle: What am I supposed to do with that? Belle and Ariel head off to the pawn shop to unlock the magic of the sand dollar and find the Pan Trap. 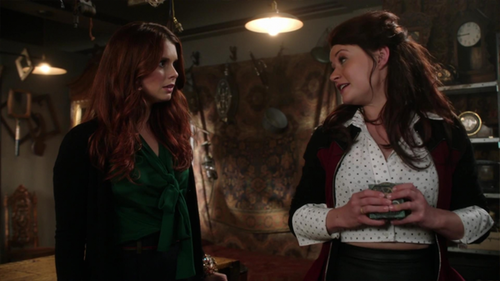 Ariel changes into adorable clothes while Belle figures out how to activate RumpleVision. It’s almost as if she’s the smart one… Quick, someone remind Belle she’s the smart one! RumpleVision: The strength of our love will help you find the secret Pan Trap. I guess that has to do. Anyway, Ariel wanders around Gold’s shop looking through his trinkets and finds a button like Eric’s because Belle and Ariel haven’t talked about how their primary motivation for anything is their men yet. Good we got that in there. Belle realizes that the strength of Rumbelle’s love is symbolized by her broken cup (I do always love seeing Chip) and she finds the super secret super powerful super trap: Pandora’s Box. Which is terribly clever, well played, show. As Belle explains, Pandora’s Box is an ancient magical item that can contain all the darkness in the world. Or, of course, hope. Unfortunately the Hipsters attack, tie up the princesses, and steal the box. Ariel: Why are we doing everything they tell us to? Belle: Because they have a gun! Ariel: I’m not afraid of you or your gun and not just because I don’t know what it is! I do really like that in this one episode we get to see four different princesses react to a stressful situation in four different ways. Snow bottles up her emotions. Emma takes charge. Belle’s confidence wavers. And Ariel is recklessly brave. But I don’t like that their actions and in most cases reactions are directly tied to a man, or in Emma’s case three men. Back on Neverland, the Love Triangle head to Dark Hollow and discuss their feelings. Hook thanks Neal for being cool with Captain Swan and Neal reacts poorly because Neal wants both Hook and Emma for himself and because he’s Rumple’s son he thinks he deserves to have everything he wants. Neal: Where did you get my cutlass? Neal: So this is an all ways love triangle? Hook: I thought she’d want something to remember you by. Neal, literally: Well, now she has me. Emma asks Hook what that was all about so Hook explains he told Neal about their kiss because he hoped it meant something. Emma: What meant something is you told the truth about Neal. You were given a choice and you chose him. Hook: And pirates always choose their Bros. It’s in the Code. Hook: Sorry, what I mean to say is I want to win you fair and fair. Emma: I’m not a prize to be won! Well, I wish she said that. She seemed to find it kinda Charming. And in Storybrooke, Belle’s crisis of confidence is really coming to a head. Ariel: So all we have to do is get free, chase down the Hipsters, steal back the Box, deliver it to Rumplestiltskin so he can trap Pan and set Neverland free, come back here and we all live happily ever after! Belle: How are still so cheery? 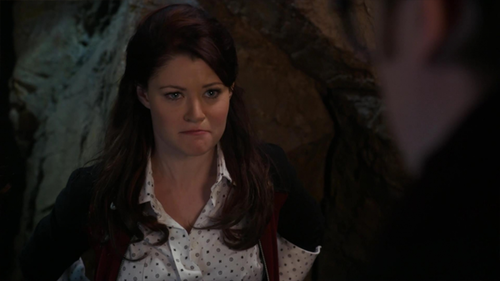 Belle, literally: I wish I could be but every time I try to be a hero it backfires. BELLE. This depression is depressing! Luckily, Ariel’s babbling gets through Belle’s melancholy and Belle realizes they can use the magical return of Ariel’s fins to break the binds. It works and the two zoom away to stop the Hipsters who Belle is smart (!) enough to realize are in the mines preparing to destroy the Box. Meanwhile Snowing are still in a fight. Snow: You didn’t tell me. You lied to me over and over! Snow: You didn’t think I’d stay with you. Charming: I don’t want that for you, this place is awful. Snow, literally: I would happily build a tree house and spend the rest of my days dodging poison arrows and lost boys, as long as I had you by my side. The Love Triangle find Dark Hollow which is a creepy cave of creepy. They need to light a magic coconut in order to trap Pan’s Shadow so Hook and Neal proceed to bicker over starting a fire. Literally. Could they BE any more caveman about this? Emma is like SERIOUSLY?! Could you not do this NOW?! Because there are Attack Shadows Attacking. The boys agree to try but fail spectacularly by dropping the lighter and blaming each other for it. The Shadows reach their goal and trap Hook and Neal while Emma hunkers down with her sword to protect the coconut. It looks bad for our heroes but suddenly Emma drops her sword and casts fire! The Shadows disperse as Pan’s Shadow is trapped in the coconut. Neal: How did you do that? Emma: Regina. She’s a BAMF even when she isn’t here. Neal: She’s teaching you magic. I can’t remember if I still hate magic. Emma: That’s just your Daddy Issues talking. Belle and Ariel find the Hipsters in the mine, preparing to crush the Box. Belle finally has her magical girl transformation sequence and stops the bad guys. Then she turns back into the Belle we know and love and befriends them, discovering the Hipsters are not Pan’s minions by choice – he is holding their sister hostage. Their sister, Wendy, who Pan keeps in that hanging cage unless he needs her to lie for him. Like now. Wendy: I’m sick. Neverland’s power is fading. I don’t know how I’ll survive. Henry: Charming Hero Complex Activated. Wendy: You look like him. Wendy: Your father. We were friends. Henry: Family History Shipping Insanity Activated. Wendy: Go, before you get sick. Henry, literally: I’ll come back for you. I promise. Pan pops in to congratulate Wendy on her performance. Then he puts her back in her box. Regina: You really think Belle can succeed? Regina: Are you sure it’s not your feelings blinding you? Rumple: Or perhaps it’s my feelings illuminating me. Regina: You really love her. And Rumple smiles and omigosh I feel invested in Rumbelle for almost the first time ever! Regina: Of Belle? I think not. Rumple: No, no, of having someone. SIGH. I mean, it is still a lovely scene. But Regina doesn’t need a boyfriend to be made whole and Rumple doesn’t need to be a manipulative prick just when I’m starting to warm up to him. Anyway Ariel comes back with the Box and is rewarded with the bracelet after Regina enhanced the spell to work however long she needs it to. Regina, literally: Now you can have legs whenever you want. Or a fin. Whatever Eric’s into these days. Ariel asks them to please find Wendy for her and Belle because they want to help the Hipsters. Regina’s priority is Henry but Rumple agrees and sends a message back with Ariel: Tell Belle I love her and she was right, will see her again. It’s really quite sweet and I will try to accept it was his real feelings and not part of some elaborate plan to tear Regina down. The Love Triangle tromp their way back to Tink’s and discuss their feelings. Emma: You two are idiots, I choose Henry. Tink appears on screen and I literally clap my hands with joy that she’s back. Tink: You people again? I told you I won’t help without proof it will work. Neal: Are we exes, too? Call me Neal now. Hook: It’s really not fair how Neal is everyone’s favorite. Emma: HENRY is my favorite. Neal: When she says Henry, she means Neal’s son. The good news is all the players are finally in place and according to the preview reunited next week. 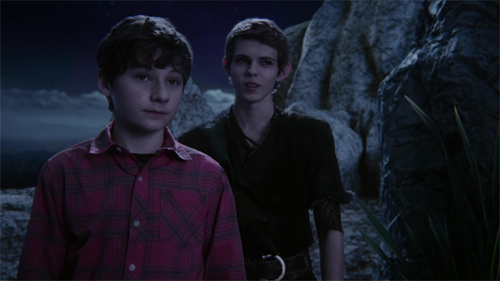 The bad news is Henry returns to Pan Camp. And he’s ready to be the hero he was born to be.